Let your kids and a couple of friends celebrate the big day by rolling around a skate park (push bikes and roller skates welcome). It is safe and fun, and they are well looked after. There are various birthday packages to choose from, which include an instructor, balloons, cake, a coffee voucher for parents and a professionally edited video (depending on which option you choose). Read more about The Shred Indoor Skate Park. 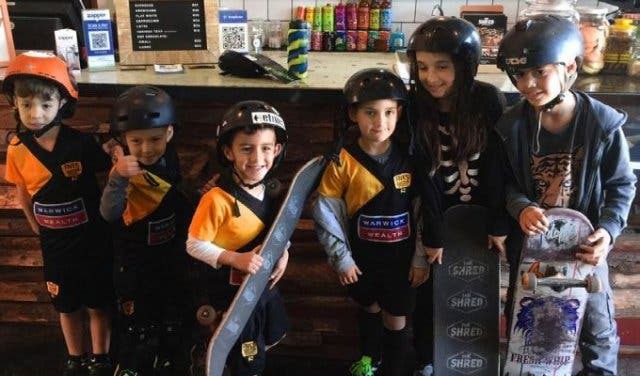 Benefit for Mum and Dad: If you choose to have the assistance of a skate instructor, you can park off in the coffee shop to get away from all the noise. Your kids will be in safe hands. Age Group: Young children to teens. Ever seen what happens when you unleash a group of kids (who can swim) into an indoor and comfortably-heated pool? Sheer joy and excitement. No one thinks about food (just hand them each a piece of cake on their way), and they are entertained, for two hours straight. 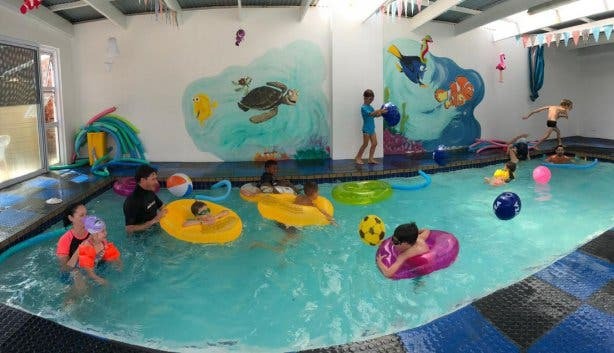 We recently discovered that Jaxx Swim School in Fish Hoek does kids’ birthday parties. Benefit for Mum and Dad: Just pay for the venue, your entertainment’s sorted and you save on food and snacks. Age Group: Young children (who are able to swim). Cost: About R950 for the venue only, pool toys included. Note: Jaxx only does one birthday per weekend for two hours on a Saturday, so you need to book well in advance. 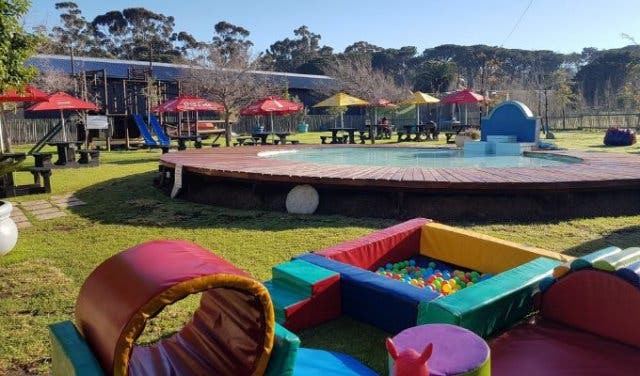 Hosting almost 25 birthdays every weekend in eight themed indoor and four outdoor private party areas, you’ll find loads of cool options, ideas and extras with a party at Bugz Playpark in Kraaifontein. Options: Over 30 party themes to choose from. Must-try: “Activity” themes: a cooking party (complete with mini kitchen and fondant fun) or makeover party (hair, make-up and nails done in a beautiful and fully-equipped room complete with mirrors and lights). Benefit for Mum and Dad: All you have to do is bring the kids and the cake, everything else is sorted. The venue, set-up, food and a personal helper. Age Group: Toddlers to pre-teens. Bonus: Access to the entire park after the party – including all the rides. Though the idea of splash pools aren’t unique, the one at Mondeor Restaurant inside the nursery just off the N2 is really worth checking out. 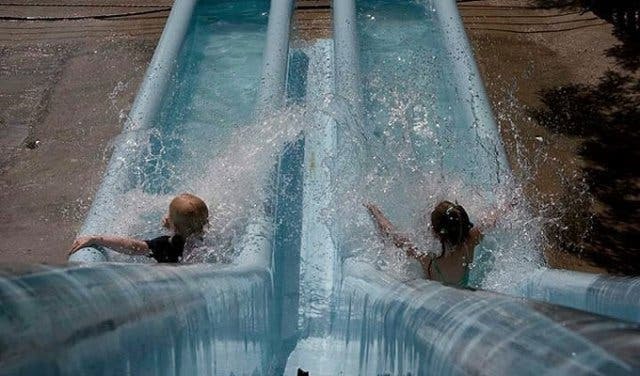 It’s only a few centimetres deep, making it ideal for toddlers and even babies. And the eatery’s tables encircle it, so you can keep an eye on the little ones. And it’s complemented by jungle gyms, slides and play areas, in a safe enclosed space. Benefit for Mum and Dad: Easy to organise, just book a table – they do all the set-up – in a safe, child-friendly space. Plus: It’s a restaurant, so there are nice food options for the grownups, too. Age Group: Toddlers to young children. 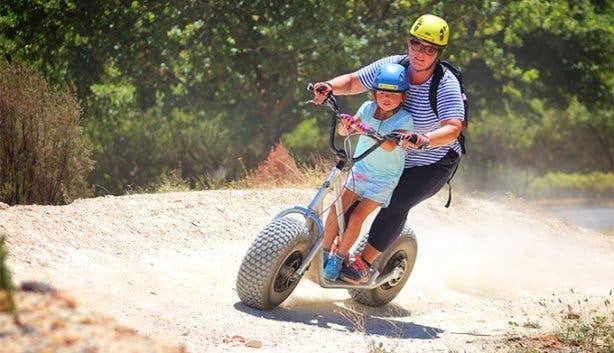 Does a bike track, sandpit and the option of a private jumping castle in your own cordoned-off space inside a safe animal farm space with calves, goats, pigs, sheep and other animals – sound good? There’s loads of shaded seating (and a kiosk) for the parents and the venue takes care of everything, from the cake, food and drinks to chairs and the entertainment. All you have to bring is cutlery, crockery and decor (if you want). 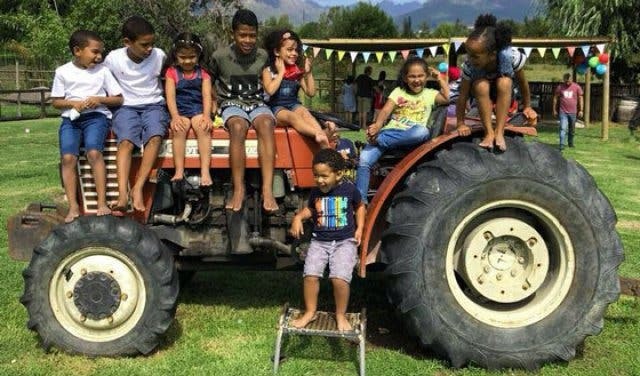 Discover easy farm-style birthdays at Vredenheim Animal Farm. Benefit for Mum and Dad: They take care of everything and the on-site kiosk is a blessing if you need to buy any extra sweeties or cold drinks. Age Group: Toddlers and young children. 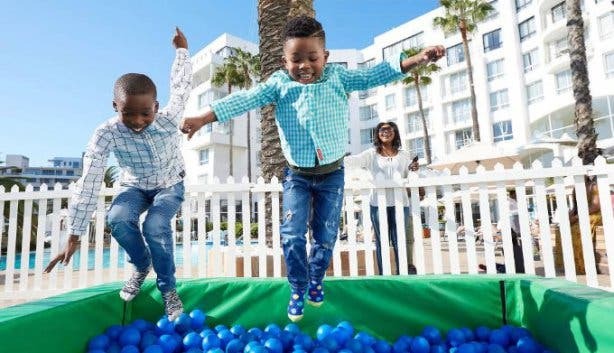 The President Hotel might not be the first place you’d think of having a kid’s party. But if it’s within your budget, it can be magic. 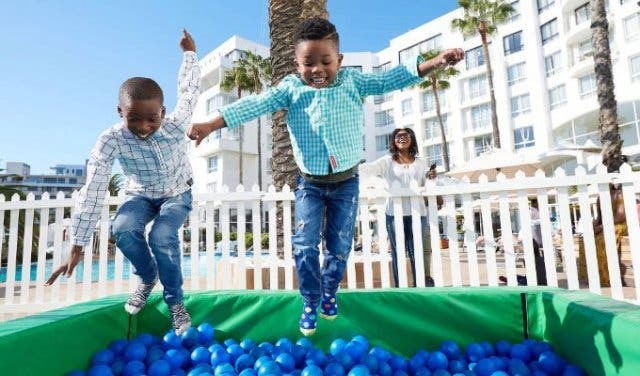 Their entire focus is on allowing parents to also relax all parties come with childminders – so take in the Sea Point views and vibe while the kids enjoy the infinity pool, jumping castles, ball pit, teepees and healthy food and drinks. Benefit for Mum and Dad: Just chill, they do everything for you. Age Group: Toddlers to teens. Cost: Starts from R200 per child. Here’s a chance to get the children away from the games consoles and out into nature in a fun way that builds social and co-operational skills. 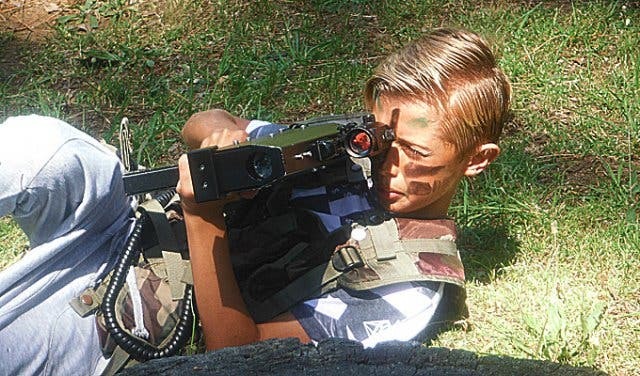 Laser tag is pain-free, high-tech and loads of fun – like paintball, but with laser equipment, so it’s safe. It’s convenient because the organisers can bring the game to a park nearest you. Discover birthday parties with Battlefield Live SA. Benefit for Mum and Dad: You can pick a location near you, so you get convenience. Age Group: 7 and up, good for teens. Cost: R2730 for 14 kids. 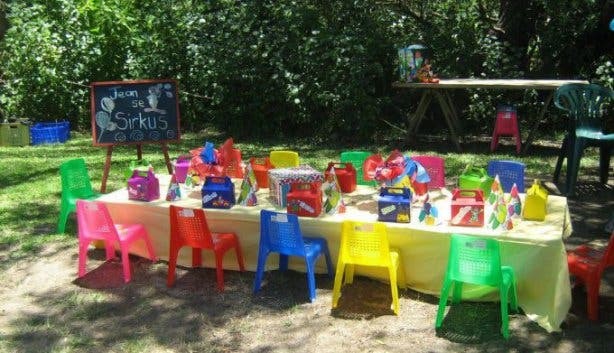 The Rainbow Puppet Theatre in Constantia might already be known as a fun, storytelling-based activity for children on the weekend, but did you know that it can make for an ideal (if not frugal) birthday party? 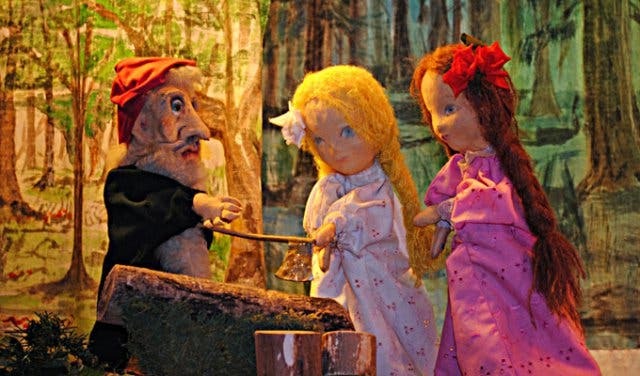 Here’s the idea: If you have 20 or so kids to entertain for a birthday, you can join any of their existing shows (classics like Little Red Riding Hood, Rumpelstiltskin etc.) on a Saturday, at just R25pp. Benefit for Mum and Dad: At R25 per person, it can be affordable. Include some snacks and share in the surrounding gardens. Age Group: From 4 up. Here’s something very different: A guided downhill off-road scooter ride through some of the most beautiful mountains in and around Cape Town. It’s outdoors, adventurous, fun and active. And you have several route options from Signal Hill near town to Jonkershoek and even the Franschhoek Valley. 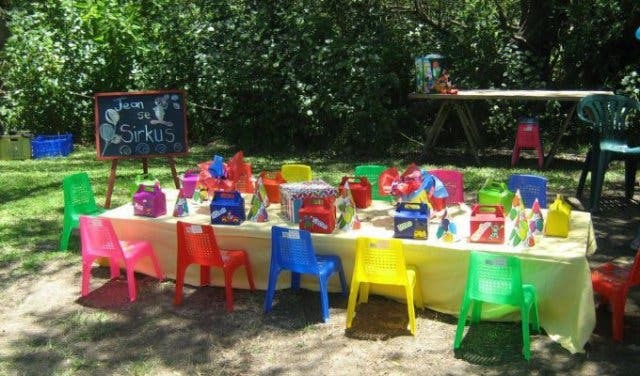 Discover birthday parties with our friends at Scootours. Benefit for Mum and Dad: No need to worry about cakes and sweets, just bring water and a thirst for adventure. Age Group: From 10 up (2–9 ride as passengers). Cost: R550pp, special rates for passengers: R270pp. 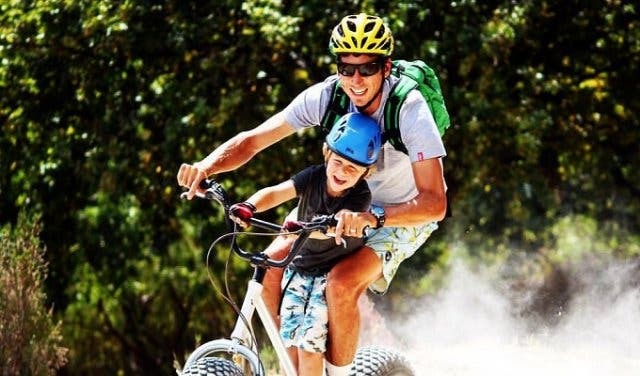 Helderberg Farm, on Klein Helderberg Road near Somerset West, has a reputation as a family-friendly venue, offering everything from strawberry picking to hiking, biking, braai and picnic. But, it’s also very geared for events, team building and birthdays. 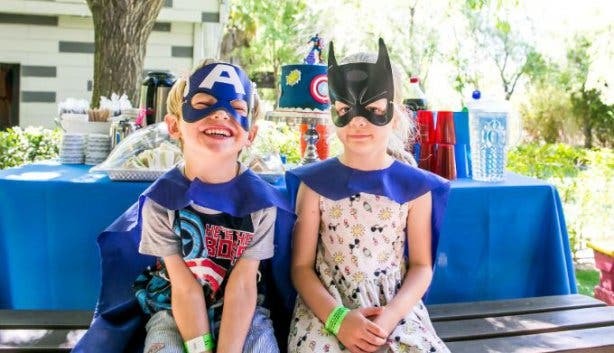 Kids’ birthdays here are outdoorsy, with a playground and loads of farm-style activities, from learning to shoot a kettie to climbing trees. They do, however, have all the usual: decor, themes, cakes, jumping castles etc. and, whatever they can’t do in-house, they can help arrange a professional to handle for you. Benefit for Mum and Dad: Your choice: You can keep it simple and just have the basics, or ask the team to recommend pro entertainers or decor specialists to make it extra special. 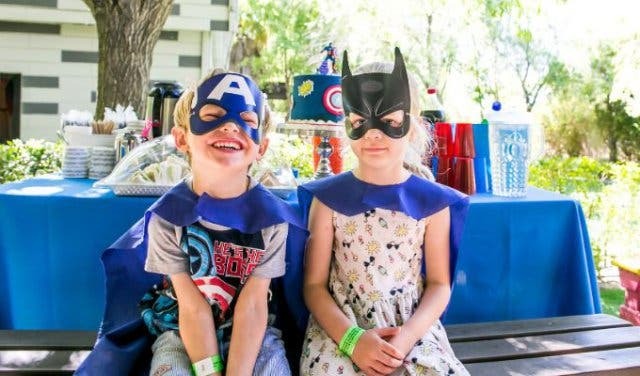 Age Group: Toddler to teen – they help you create different types of parties for various ages. Your kids won’t be short of entertainment here. 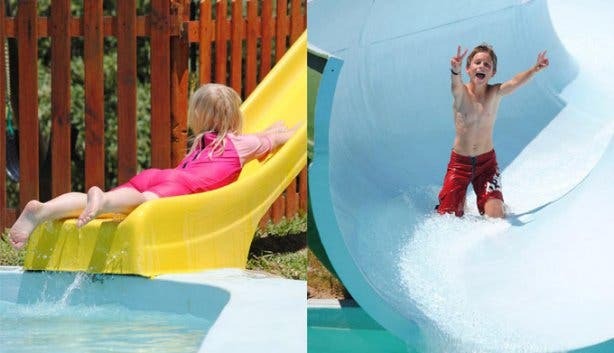 There are five waterslides, including safe play areas for under-6s as well as other attractions such as putt-putt, a jungle gym, zip slide, obstacle course and shaded café. You get two hours of access to all rides, as well as a picnic table area for the party. And you can choose whether you want to bring your own party packs and cake etc., or have it all taken care of in-house. Check out the birthdays at Waterworld in Strand. Benefit for Mum and Dad: Kids have full access to all activities and there are lifeguards and personnel on hand to ensure their safety. 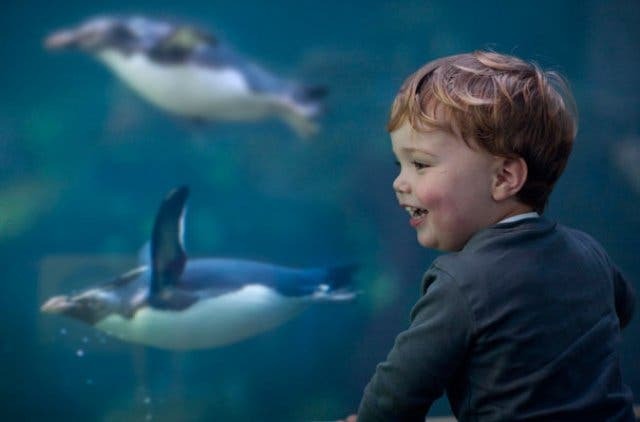 Although they no longer offer birthday parties at the city’s famous aquarium, you can now get free access to the Two Oceans Aquarium on your birthday. And, if you bring a group of 10 people or more (like for a birthday party excursion, for example) you get 10% discount on the price of everyone’s ticket. 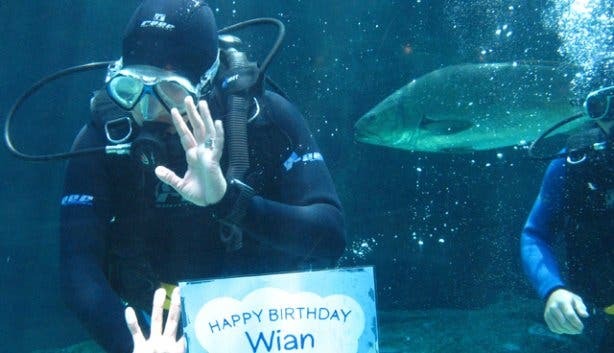 Discover free birthdays at the Two Oceans Aquarium. 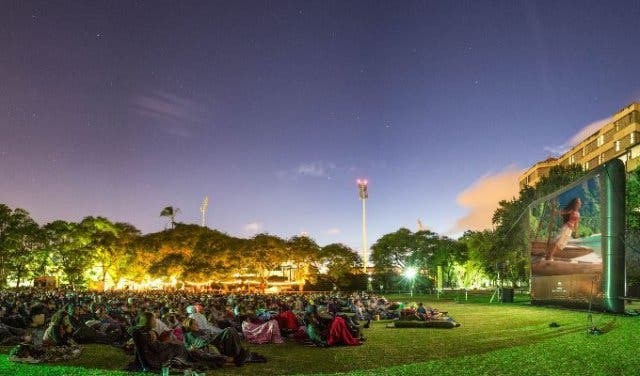 You can also now get free entry, a backrest and a blanket on any movie showing on the day of your birthday at the Galileo Open Air Cinema. PLUS: 10 more free things on your birthday in Cape Town. Discover over 50 things to do with kids, as well as 20+ free and cheap things with the family. For adults, have a look at our choice selection of special places to have your birthday.